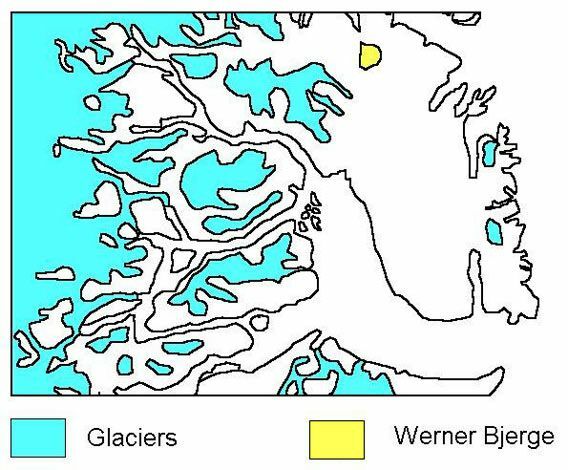 Situated north of the Scoresbysund between Stauning Alper and Jameson Land, only few people will ever get to see the Werner Bjerge. This relatively small mountain area has a geological history which doesn’t fit into any of the other chapters described so far. Despite of being small and remote, they shall be mentioned briefly here as a geological specialty and because they are of economic interest. During a late stage of the volcanims, which was related to the opening of the north Atlantic, a volcanic complex formed here about 30 million years ago. It is not known for sure if lava masses actually came through to the surface, but this has probably happened. But it is well documented that a magma chamber formed or rather a comlex of several ones which grew together to form a larger unit. This happened at a large depths below the surface. Erosion has subsequently eroded the rocks on top, so now the magma chamber itself is exposed. The result is not only a view into the heart of an ancient volcano and thus interesting for geologists, but also of economic relevance due to molybdenum deposits.